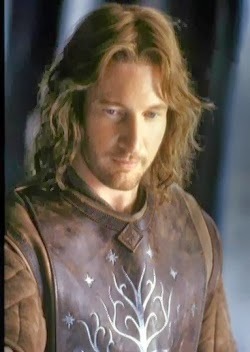 Jackson apparently thinks the characters Tolkien gives us are too simply good to be fully believable to modern audiences, and so he feels obligated to “complicate” them, to give them internal conflicts other than the ones they actually have, in the hopes that we will better be able to relate to them. I’m quoting from this article in the Nov/Dec 2013 Touchstone Magazine, in which Donald T. Williams explains how literature, while delighting us with its art, is more powerful than history or philosophy to nurture our moral vision, or to corrupt us with false images. By this process of negative moral transformation, in other words, we reach the place where beloved characters are unrecognizable to Tolkien’s fans, and those fans feel betrayed. And they are right to feel so, though mostly they do not understand why. It is because the difference between the books and the movies is not just one of necessary adaptation to a different medium. It is that the author consciously followed the Sidneyan tradition while the adaptor is either ignorant of it or doesn’t understand it or has rejected it. What you put in the dough you’ll find in the cake. So much talk about education…It’s a theme of many Internet articles that have come my way in the last couple of weeks, and I’m trying to pull them together here. If education is about the forming of a person, about what children learn and about how they are prepared for whatever we consider to be a successful life, then it’s not surprising that I see nearly every little thing in the world as related. “What you put in the dough you’ll find in the cake,” is a proverb that speaks to me metaphorically of the growth of a person. A real cake is also affected by things you don’t consciously add to the mix, such as the temperature at which it’s baked, and the moisture of the air, and whether you can prevent someone from opening the oven door at the wrong moment. Human beings are much more complicated than cakes, and only God knows everything about us and what influences and ingredients through the years are making us who we are. Even so, He has given us a lot of wisdom and common sense about how to nurture our young and facilitate healthy growth. One part of our education is what we learn in school. Though only a smaller fraction of that part is formed by the curriculum and the teachers’ efforts, it’s usually what people mean when they talk about the subject. Lately it’s the Common Core goals of our nation’s Department of Education that are in the news. Janet wrote on the subject and how the goals might be contrasted with some words from Wendell Berry on what education is. Another article I ran across treats the Orwellian tendencies of the Dept. of Education, which wants to create a huge database using statistics about our children and their test scores and jobs from birth on into the future. This discussion may seem tangential — but don’t you think that children learn something a bit skewed about what it means to be a person, when their privacy is diminished and their labors and accomplishments are reduced to measurable facts that will fit on charts and graphs in the service of The State? And that’s just one questionable ingredient in the cake I am envisioning. So many things our children learn may as well be molecules in the air they breathe, they are so unconsciously incorporated into their philosophical selves. Since most children spend much of their time at school, many of these unhealthy ingredients first enter the dough during those hours, as ideas, assumptions, or practices. Everything that goes in contributes to what they come to think of — or to live — as normal. The perspective of this man (who has very good sense considering his youth) on relationships, specifically how “the fullness of another person’s identity is a secret between them and God,” fits in here. That’s a truth that The State does not take into consideration or encourage anyone to explore personally. But what sort of education would leave out God? It’s from Him we get wisdom and understanding. If your children must go to a public school, and you believe that God is real, then you better explain to them that every school day they are going into enemy territory; isn’t it the work of our enemy the devil to make us think that we can leave God out of everything for several hours of the day and call it “neutral”? Warn them that much of the “food” that will be offered them during the school day is poison. Or if at all possible, follow the example of the writer of my next linked article. Amanda writes at A Chime of Hearts about education, but she doesn’t use the word much. In this particular post she tells about the learning she and her brother did in their loving home, learning which to some people might sound a bit haphazard or incomplete, but which consisted of a spiritually and academically rich lifestyle. This education formed an understanding of the world that Amanda now passes on to her own family and even to the blogging world. She has a wisdom beyond her years and I’m personally thankful to her parents for providing the atmosphere and nurturing that contributed to it. For specifics, and for the many specific reasons this kind of reading material is hurting our children, please read the article. The sort of books she writes about I’d like to gather by the dozens off the library shelves and throw into a big bonfire! They seem always to be paperbacks, and would make a good hot blaze. May the Lord have mercy on our young people — they are under attack by forces that would like to cripple their souls, turning what might be sweet cakes into bitter. I have to keep reminding myself (mixing metaphors) that God can restore what locusts eat (Joel Ch. 2), but it’s painful to watch the destruction. Children learn other untruths about the world in many of the movies made just for them, as another of Anna’s links points out, this one to an article in The Atlantic. Such as: 1) Just believe in yourself and you can accomplish anything — no limits. 2) Your parents are too old and dull to realize this so it’s o.k. to defy their authority, and 3) You have a right to skip over the lower rungs of the ladder of success (and the people who are toiling there) and go quickly to the top, because you were made for greatness. I’m more familiar with Charlie Brown, whom the same Atlantic writer Luke Epplin points out is a fictional character more likely to keep us in touch with the real world. I’ve so often heard, “It’s only a story!” or “It’s just a movie, for heaven’s sake.” Yes, for Heaven’s sake, realize that the vicarious experience we get from books and movies is a very potent type of experience. In just the last month I’ve heard many stories from teachers and administrators around the nation, of the mixed-up lessons being taught to students by the school policies that stem from something other than a good educational philosophy. I’m not smart enough to articulate all the lessons that I intuit are being learned. They are not always acknowledged as part of the curriculum to be taught, and sometimes the “lesson plans” can only be extrapolated from a kind of Doublespeak. Certain behaviors and attitudes may be subtly or clearly encouraged or discouraged, and too often the treatment of the student is insulting or disrespectful of him as a person made in the image of God. For example, today I heard from the administrator of a nearby high school that the school is legally responsible for any criminal behavior of the student not only while the student is on campus, but also after school until he arrives home. Theoretically, because “it’s all about liability,” if at a non-school dance on Saturday night a student gets in a fight, and the altercation can be construed to have begun at school the day before, the school can be held responsible for any damages. A truth that is fundamental to any education, that each person is responsible for his own behavior, is being turned on its head. I have more than one blogger to thank for a link to this article pointing out that in schools even reading is actually discouraged, no matter what the posters and slogans might lead you to believe. Why should that surprise me? Reading is a wonderfully private encounter with whole worlds that you can explore — and yes, where you can have life-changing experiences. My last link should not be heavy or discouraging, because it’s about play. Unfortunately it’s about the deficit of play in the lives of many 21st-century children. Their hours and days are overly managed to the point where even activities that used to be play have become work. When some of us were discussing this problem I found out that at the school that one of my grandsons attends, there is a rule against running on the playground. Every day at recess the children are lined up so that this rule can be explained to them once more. Having raised a couple of boys myself, and having eight grandsons — and being married to a boy! — I didn’t know whether to laugh or cry at this idiocy. It’s insane, and yet, it’s an inhumanity of sorts that these children have had to receive in a daily lecture and get used to, to learn and accept as normal. Again, it must be all about liability. And they may run on the soccer field, so perhaps it isn’t as bad as it sounds? Except that it is! It’s hard enough that little boys should have to sit at desks for an hour or two at a time, but then, when they go out for recess, what do they get? It sounds like the prison yard. I’m sorry, but this last story has put me over the edge and is the cause of my cake (blog) also overrunning the pan very messily. At least I do know that all my grandchildren have excellent parents who have always provided for plenty of play time, so in their case I don’t worry. I just fume, and grieve for the children of our society who have so much to put up with. I pasted in pictures of my children and grandchildren playing, to cheer us all up. 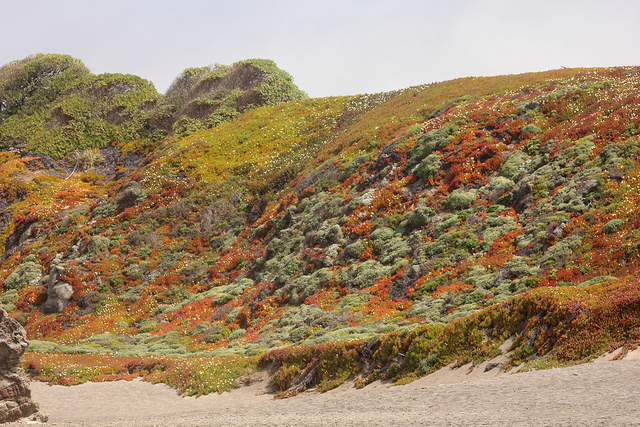 This week we tripped over to the coast with Mr. and Mrs. C. A walk along the shore north of the town of Bodega Bay was first on the leisurely agenda. Schoolhouse Beach was closed, so we drove a little farther north to Portuguese Beach. It’s steep where the waves break on the sand, and signs warn you not to turn your back to the surf or to go on the down side of the slope, where an undertow can get you in its grip. We strolled the length of the beach and back, admiring the view landward and seaward, and then sat on a log. Mr. and Mrs. C didn’t have their frisky Yellow Lab with them, but we’ve seen how she loves to romp in the water at Lake Tahoe or at nearby Salmon Creek Lagoon. As we were climbing back up the cliff to the car, we met a couple coming down with four dogs, no matter that pets are not allowed on that beach. A tall great dane, two medium dogs with long hair, a tiny dog, and their owner carrying colorful beach ball. We stopped at the top for a while and watched the Dane canter around joyfully. The mid-sized dogs pushed the beach ball into the waves and along the ocean’s edge — all right at that steep part that is so dangerous. Mrs. C. commented about how many people go into the ocean to rescue their dogs; the people often drown, but if they only had known that dogs almost always manage to get back on their own…. When I was researching for this post I discovered a news story and photo depicting a case of that very thing: a dog owner having drowned when she went after her dog and got caught in the surf. That time the dog did drown also, and it was at just this time of year. 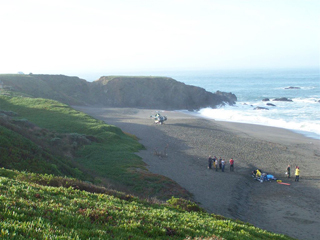 These accidents, though not always involving dogs, happen so often on the Northern California coast that the multiplied effect has turned them into horror stories for me. “Birds” children running downhill from schoolhouse. A bit inland from Bodega Bay, we came to the town of Bodega. Confusing, isn’t it? Both are famous for the Alfred Hitchcock movie “The Birds” being filmed here in the early 1960’s. I saw it in my teens, and can still recall sitting on the living room floor, self-consciously and silently terrified. Ever since then, when I see crows looking down from telephone wires, I know from the experience of that movie that they have a sinister intent. The schoolhouse today, a private residence. Hitchcock mixed up scenes from the two towns for the film, and we checked out two of the landmarks that remain in Bodega: the schoolhouse and the church, which stand very close to one another on a hill. Within the last year we Glads and the C. couple watched “The Birds” together. It wasn’t as scary as I remembered, but I still don’t like it. I do like the buildings in Bodega. 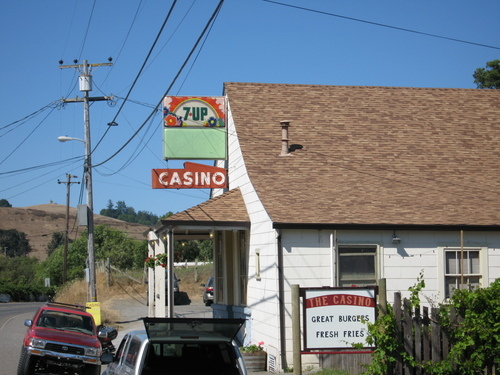 On our way back from the beach we first stopped at a historic watering hole in the town; the Casino’s bar was built a hundred years ago by the bartender’s great-uncle. His grandmother still manages the place, opening the doors and closing up every day even in her 80’s. The dining room (the sign said “Dinning Room”) was most appealing to me. It was fresh and clean and empty that afternoon, tables, chairs and floor of bare weathered wood as old as the bar. A dozen or more deer and elk heads decorated the walls around. I drank an Ace Peary Hard Cider, brewed locally. After our refreshment we walked along a muddy little track through the grass along the bank above the road, to see the church and the school. The church is St. Teresa of Avila. 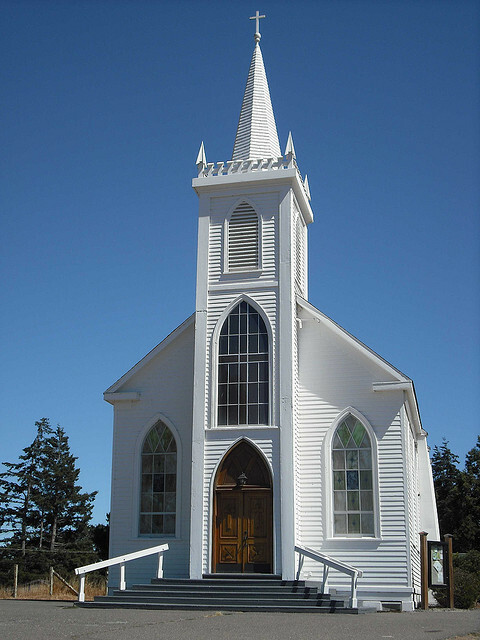 Services have been held there weekly since its dedication in 1861. From the church you can look down on the little artsy town of Bodega, as in the photo below. When we had set out from our house that morning, I decided not to bother with a camera. Then of course I regretted it many times! I was lucky to find all of these pictures on the Web. I’m happy to say there was nothing horrific about our meandering day. That’s a good thing about enjoying the present moment: one doesn’t have to be subject to artists’ imaginations, to old news articles, or to one’s own memories of bad things. “Sufficient to the day is the evil thereof,” and as there wasn’t any of that sort of thing on our outing, it provided sufficient R&R for my weary soul. Thanks be to God!